Secondary production includes new biomass produced by microbial and animal growth and reproduction. In lotic ecosystems, animal production is due primarily to the meiofauna, macroinvertebrates, and fish. It represents the production of new biomass over some time period, often a year, due to growth and recruitment and accounting for losses to mortality, and commonly is expressed in mass per area per time (Benke 1993). The ratio of production to biomass (P/B), called the turnover rate (in units of time), is a measure of the productivity of some population or assemblage. High P/B ratios usually are associated with fast life cycles and rapid individual growth rates. High production may be due to a high P/B ratio, high biomass or both, but usually is due to high individual growth rates and short life spans resulting in rapid population turnover (Huryn and Wallace 2000). The magnitude of secondary production can be calculated for a population of a particular species in a stream reach, for the most common taxa, and for an entire assemblage (Benke 1993). The measurement of secondary production requires estimation of biomass per unit area, also referred to as standing stock, and of growth rate. Typically one uses wet mass for fishes and either dry mass or ash-free dry mass (AFDM) for invertebrates. In species with cohort population structure, usually seen when reproduction occurs annually, growth rate can be obtained by measuring the average mass of individuals sampled frequently, often monthly. When growth rates are more rapid or cohorts overlap it may be necessary to measure growth rates in the laboratory, usually across a range of temperatures and at different stages of the life cycle. Production is the product of mass-specific growth rate and population biomass, so factors influencing either growth rates (primarily temperature and food availability) or population biomass (habitat suitability, discharge fluctuations, resource supply, and predators) can affect production. Studies of secondary production by macroin-vertebrates are undertaken to obtain a better understanding of energy flow through populations and to investigate the trophic base that supports the population. When secondary production is estimated for an entire assemblage, it can then be compared with estimates of primary production and production of fishes to examine energy produced and consumed at each level. Benke (1993) and Huryn and Wallace (2000) provide excellent reviews of the more than 2,000 estimates of stream secondary production worldwide. Conversion to common units is achieved by assuming that dry mass = 0.2 x wet mass and 1.11 x AFDM. Studies from small streams greatly outnumber those from larger rivers, few are from tropical latitudes, and annual production values vary greatly, from approximately 1 to 103 g m 2 year1 dry mass. The highest values on record are from dense aggregations of filter-feeding black flies in lake outlet streams with favorable temperatures and an abundant plankton supply (Wotton 1988); however, any estimates >100g m2 year1 are exceptional, and most are considerably lower (Huryn and Wallace 2000). Figure 8.12 shows that most estimates for individual species are below 10g m 2 year1, many are <1, and highest estimates are from filter-feeding invertebrates. Estimates of whole stream secondary production are relatively few and highly variable, making it difficult to generalize. The highest value from an unaltered stream, Sycamore Creek in the Sonoran desert of Arizona, was 135 g m-2 year1 (Fisher and Gray 1983). In contrast, annual production was 4.1g m-2 year1 for the shaded Hubbard Brook in New England (Fisher and Likens 1973). Extremely high secondary production has been recorded from some anthropogenically enriched systems, e.g., 268 g m-2 year1 for a river in Wales (Lazim and Learner 1986), and 612 g m-2 year1 in the New River below a dam (Voshell 1985 cited in Huryn and Wallace 2000). In the summary of 58 studies of production for entire macroinvertebrate communities, Benke (1993) found that 40% reported levels of <10g m-2 year-1, 78% reported levels of <50g m-2 year-1, but only three studies reported levels less than g m-2 year-1. The majority of annual P/B ratios tend to fall between 1 and 10, with occasional estimates throughout the 10-100 range, and a few higher yet. Among functional groups, the highest production estimates were from filtering collectors, and both shredders and predators tended toward lower values (Benke 1993). Over 75% of P/B estimates for predators were <10, presumably because of their relatively large size and long development. Over 90% of shredder P/B estimates were < 10, and large body size and poor food quality are the likely explanations. Small consumers with a high-quality food supply have been recorded to achieve very high P/B ratios. 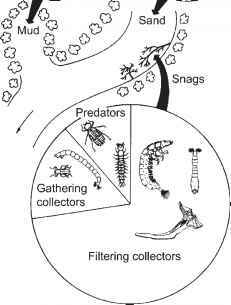 Benke (1998) estimated turnover rates for two larval chironomids dwelling on snags in the Ogeechee River to be 158 (Rheocricotopus, a filtering-collector) and 258 (Polypedilum, a gathering collector). The turnover rate for Poly-pedium is the highest reported for a metazoan and indicates that its biomass is being replaced almost daily. In Sycamore Creek, Arizona, the annual production by all Chironomidae was 58 g m-2 year-1 and the P/B ratio for this group was 121.5 (Jackson and Fisher 1986). Further evidence of the influence of life span can be seen from the comparison of cohort (life span) P/B ratios, which usually range between 2 and 8, versus annual P/B ratios, which range from <1 in species that may require 2 years or more to mature, to >100 in species with many generations annually (Huryn and Wallace 2000). The freshwater mussel Unio, with a life span of at least one decade, has an annual P/B < 0.1 (Negus 1966). High production tends to be the consequence of high growth rates more than of high biomass. Estimation of secondary production coupled with examination of diet can provide valuable insight into energy flux through individual species. Annual secondary production by filter-feeding caddis larvae (Cheumatopsyche spp. Hydropsyche rossi, and Chimarra moselyi) occupying snag habitat in the Ogeechee River, Georgia, was 43.5-63.9g m-2 of snag surface (Benke and Wallace 1997). Production by Chi-marra peaked during summer, whereas Hydro-psyche production was greatest from late summer through winter, and Cheumatopsyche showed no defined pattern. The omnivorous Cheumatopsyche and Hydropsyche derived 51% and 64% of their production from animal food and 41% and 24% from amorphous detritus, respectively. The production of C. moselyi was primarily based on amorphous detritus (91%). The contribution of detritus to production was higher in the Ogeechee than in another study conducted in the Tallulah River (Benke and Wallace 1980), apparently because of greater bacterial biomass associated with FPOM and a higher density of drifting invertebrates in the Ogeechee. A number of environmental factors affect growth and thus secondary production. Temperature is the most important variable affecting growth, which often at least doubles for each 10°C increase within tolerance limits of the species. A midge larvae studied in a warm-water river in Georgia showed some decline in daily growth rate at temperatures above 25°C, whereas a mayfly and black fly did not (Figure 5.18). The highest growth rates reported for stream insects are from warmwater streams in Georgia and Arizona (Huryn and Wallace 2000). Food quantity and quality are major determinants of secondary production. The highest production values observed are from densely packed populations of filter feeders that have a rich food supply from a lake outlet (Wotton 1988). 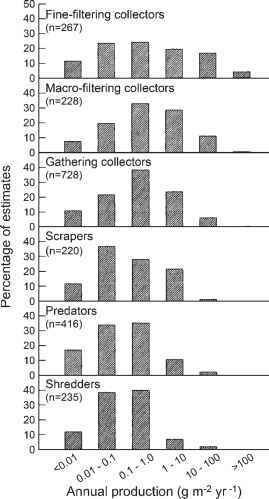 Shredders, scrapers, and predators are much more likely to be limited by available resources (Figure 8.12). However, despite its low quality, allochthonous detritus is important to invertebrate secondary production, as can be seen from a leaf litter exclusion study in headwater streams of Coweeta Hydrologic Laboratory. After 4 years, total secondary production in mixed substrate habitats (cobble, pebble, and sand-silt) had decreased by 78% compared to pretreatment values, demonstrating a strong impact of the exclusion of terrestrial detritus (Wallace et al. 1999). However, secondary production of invertebrates living on moss-covered bedrock was not affected. These were filterers, collector-gatherers, and predators, so were less dependent on coarse detritus and likely derived their production from transported FPOM. In a shaded, second-order stream and an open canopy, fifth-order stream in Hubbard Brook Experimental Forest, Hall et al. (2000) found that invertebrate secondary production was low in both rivers compared with other systems. Detritus supported a high fraction of production in both (63% in the second-order stream and 50% in the fifth-order stream) and animals were the second most important source (27% and 22%, respectively). The contribution of algae was higher in the fifth-order stream (22%) than in the smaller stream (4%). Although the shaded and open stream reaches differed in the contributions of allochthonous versus autochthonous energy sources as expected, the effect was relatively small. times greater than on mud); however, production on snags was only 3-4 times higher than in sand and mud habitats, suggesting that turnover rates of their primary consumers, mostly chiro-nomids and oligochaetes, were higher in the benthic habitats. 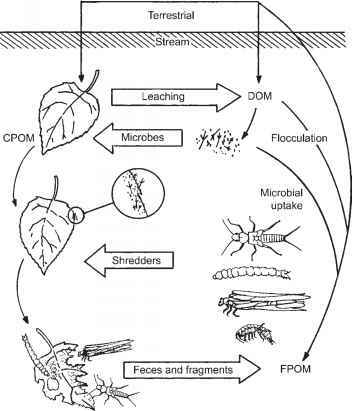 Few studies have estimated invertebrate secondary production in tropical streams. In Costa Rica, Ramirez and Pringle (1998) estimated a very low secondary production by benthic insects (364 mg AFDM m 2 year1) compared to estimates in subtropical and temperate systems. However, P/B ratios were between 5 and 103, suggesting that biomass turnover was high. High flows, resource limitation, and predation by shrimp and fishes likely explain the low insect production in this river. In a Hong Kong stream, production was higher than in the Costa Rica stream, but values still to were low compared to other systems (Dudgeon 1999). Most studies of invertebrate secondary production neglect the meiofauna, and their contribution may be substantial. In a study of the entire metazoan benthos larger than 42 |im in an acidic stream in England, total production (5.2g m 2 year1) was modest, probably due to the acidic conditions (Stead et al. 2005). Although permanent meiofauna represented only 3% of the total biomass, they contributed 15% of the total production. The average P/B of the permanent meiofauna was 38, much higher than the value of 7.6 for the metazoan community. When production was estimated based on size, the permanent and temporary meiofauna (small oligochaetes and early instars of insects) contributed 51% of the total. Clearly, exclusion of the meiofauna can lead to serious underestimates of secondary production. The study of fish production has a long history of quantitatively rigorous analysis, following the pioneering work of Ricker (1946) and others. From the perspective of stream ecosystem production, a famous study by Allen (1951) in the Horokiwi stream, New Zealand, sparked decades of study into what became known as Allen's Paradox. Production by brown trout, which was estimated reasonably accurately, greatly exceeded the biomass and assumed production by invertebrates, which at that time was an approximate value. Suggested answers included a hidden role for the hyporheic and meiofauna, higher P/B ratios than were thought to be common, and terrestrial subsidies. However, even as the accounting improved, the consumption by fish seemed to at least press the limits of secondary production by invertebrates (Allan 1983), raising doubts that a reasonable surplus of prey survived to maintain their populations (Huryn 1996). Huryn was able to account for the food demands of brown trout in another New Zealand stream, but only by including all compartments of the stream ecosystem. Surficial invertebrates provided most of the food consumed, but the full accounting included hyporheic and terrestrial invertebrates, and cannibalism upon young trout (Figure 8.14). Intriguingly, there was still no "leftover" invertebrate production, and Huryn suggested that uncertainty in estimates might explain how sufficient individuals survive for population replacement. Because Huryn's study indicated that trout consume 80% or more of invertebrate production, he inferred that top-down control of benthic prey populations must have a strong influence in his system, and probably in similar systems as well. A long-term study of trout populations in a Minnesota stream illustrates the value of biomass and production estimates in interpreting population dynamics (Waters 1999). In a stream initially populated only by brook trout, a 21-year-long study documented how floods, sedimentation, and invasion by brown trout reduced brook trout standing crop from 184 to 4 kg ha ^ and production from 171 to 9 kg ha 1 year1. By the end of the study, brown trout production was 322 kg ha 1 year1, and so the species replacement resulted in trout production that was markedly higher than observed previously.